Kennedy continued to expand his open-ended Albany Cycle. While the first three novels in the cycle unfold in a Depression-era setting, the next three explore various periods in the city’s history. 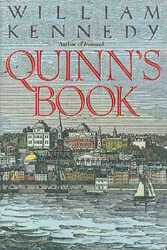 Thomas Flanagan wrote in the New York Review of Books thatQuinn’s Book (1988) “reaches out from Albany to an impressionistic nineteenth-century America, a land of slavery and warfare and haunted (rivers)” (Thomas Flanagan, New York Review of Books, 4/25/02) and follows the picaresque adventures of a Phelan ancestor, Daniel Quinn. “a tour de force of historical fiction driven by a visionary imagination …"
Quinn's Book was published in England, France, Germany and Israel.